The first of the shorts was Ding Shiwei’s black and white “Double Act”, which reminded me of a continuous modernist semi-abstract painting. It explores ideas about ideology, different schools of political thoughts and the mass movements they inspire, and ultimately, along with the loud, repetitive and relentless accompanying music, how interchangeable these ideologies and movements are, how societies always keep moving, but don’t necessarily move forwards. The second film, Wu Chao’s “Chasing”, is the one I find most interesting out of the works exhibited. The animation opens on a sort of twisted fairy tale scene, with a group of infant like figures in red hooded capes, running through a forest encountering a series of grotesque tableaus. In the distance, a sinister, solitary figure builds a wall, dividing the forest and urban streets filled with glamorous laughing party-goers. As the two scenes merge, we find out that all is not as it seems. Shadows lurk everywhere and society makes robots and puppets of us all, while the puppeteer, a dim-witted parody of the average citizen, capers around a playground built on human pain and suffering. The pastel colours and children’s story style of the artwork, and the beauty of the Constructivist soviet style architecture offsets nicely against the grim torture scenes. I had been most looking forward to Qiu AnXiong’s “New Book of Mountains and Seas”, inspired by the Book of Mountains and Seas (circa 4th century BC), the foundation for many later Chinese myths. However, the series of monsters shown in this film merge into different things, without much of a plot. Even though this mirrors the original book, which mainly documents mythical monsters from different regions, some text indicating connections with the original myths would greatly help the audience’s understanding. Nevertheless, it was interesting to see the two-headed snake creature emerge from an ancient tomb and metamorphose into the iconic cityscapes of modern Shanghai, and to see that warring factions, nuclear explosions and aliens categorized as today’s monsters. The dark and dystopian themes in this selection are well balanced by the light-hearted and colourful animation from Lei Lei, “Cotton Candy Universe” and “Pear or Alien”. The bright colours and pop art style clearly have their Western kitsch influence whilst the background resembleing old children’s exercise books, the colour scheme and objects depicted in Pear or Alien, shows inspiration drawn from traditional Chinese art and brings a sense of nostalgia. I am glad that the Chinese are beginning to learn that there is nothing wrong with simply expressing one’s love of cotton candy, or describing a fantasy in which pears save the Earth from alien invasion. The highlight of the evening was definitely Bin Bai’s “The Hunter and the Skeleton”. Watching this Tibetan animation, I felt like I was at once in the familiar world of video games, and watching something that wasn’t like anything I’ve ever seen. This Eastern Tibetan folk tales tells the story of a hunter who goes hunting against the warnings of Buddha, he encounters a demon skeleton who lives on human souls and makes a deal with the demon. 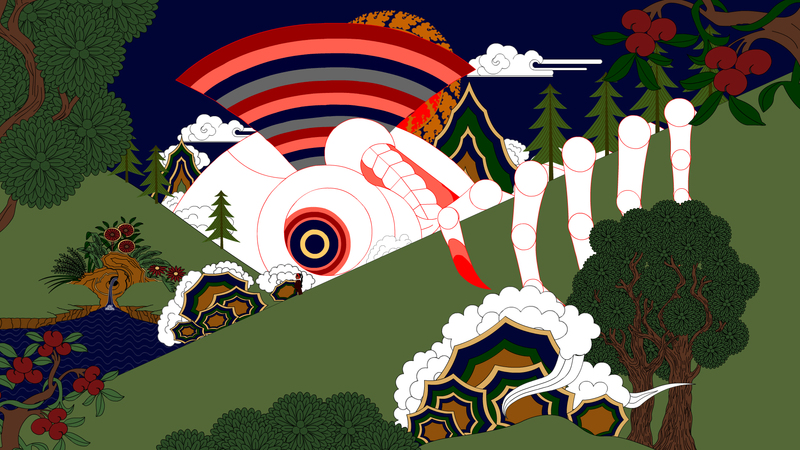 The bright colours and exaggerated lines bear certain similarities to iphone App game graphics, and provide a helpful sense of familiarity, but otherwise the work is steeped in absolutely gorgeous traditional Tibetan Thangka art style, from the depiction of characters, nature, to buildings and inanimate objects. The story is playfully told, and the work stands out as the only narrative animation from the selection of works shown. The screenings were followed by an interesting panel with CIFF’s organisers, who spoke about the wave of independent Chinese movies that grew out of the government initiatives from around 2000 and the innovative new styles Chinese indie animators have created combining technologies such as Flash, 3D animation software, with painting and photography. It was great to know that there are three other independent film festivals happening in China apart from CIFF, and about 70% to 80% of the country’s independent output does get shown in these festivals. One of the organisers talked about how traditional Chinese animation techniques have largely died out, due to historical reasons and the shift in technology. A lot of these techniques were employed between 1949 and 1989, when stories from Chinese myth and folklore were animated using traditional techniques such as puppetry, ink wash painting and Dunhuang art styles. This was recognized internationally as the period when China established its own school of animation. If you’d like to find out more, you can find an introduction to my History of Chinese Animation Talk. It would be great if the Chinese school of animation could somehow be revived.